Acoustic telemetry, radio telemetry and PIT tag technology are being used to characterize migration patterns and passage efficiency in the Penobscot River, Maine. Maynard, G., Izzo, L., and Zydlewski, J. (accepted) The fate of hatchery-spawned Atlantic Salmon kelts released into the Penobscot River, Maine. Marine and Coastal Fisheries. Holbrook, C., J. Zydlewski, M. Kinnison, Gorsky, D., and S. Shephard (2009) Movements of pre-spawn adult Atlantic salmon near hydroelectric dams in the lower Penobscot River, Maine. North American Journal of Fisheries Management. 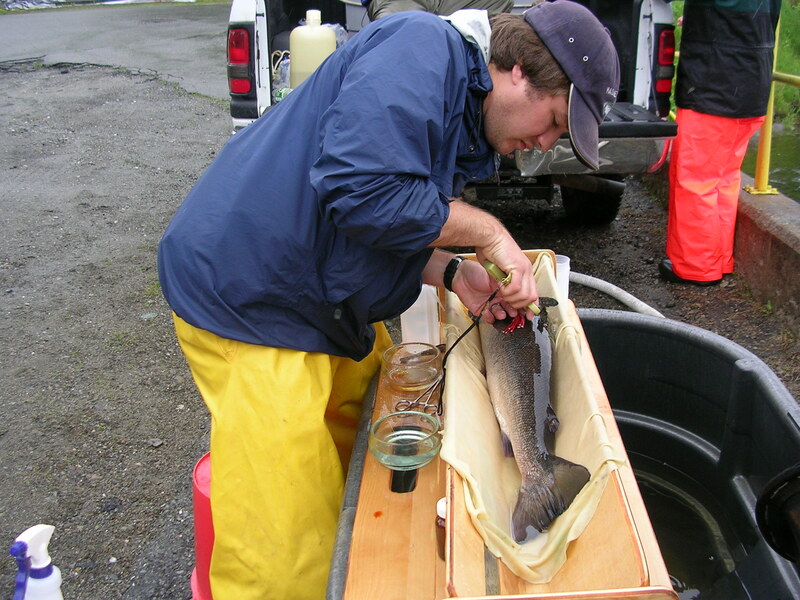 Holbrook, C., Zydlewski, J., Kinnison, M. (2007) Assessments of migrating Atlantic salmon (Salmo salar) smolts in the Penobscot River using acoustic telemetry. 137th Annual Meeting of the American Fisheries Society. San Francisco, CA. September 2-6. Holbrook, C., Zydlewski, J., Kinnison, M. (2007) Riverine passage success for pre-spawn adult Atlantic salmon in the Penobscot River. 137th Annual Meeting of the American Fisheries Society. San Francisco, CA. September 2-6. Holbrook, C., J. Zydlewski, and M. Kinnison (2008) Effects of hydroelectric dams on survival and behavior of migrating Atlantic salmon smolts in the Penobscot River, Maine. Atlantic Salmon Research Forum. Orono, ME. January 8. PRESENTED.